A surprisingly beautiful album for fans of epic pagan black metal comes from the Germans Fimbulvet. Another band from Thuringia (that is creating a very remarkable stage) Fimbulvet was founded in 2003. After their demo “Gjallarhorn” in 2004, they released their debut “Ewiger Winter” in 2006. 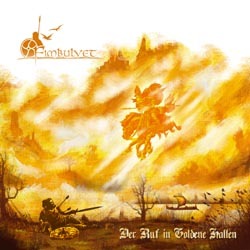 So they return in 2008 with their second and much improved album “Der Ruf in Goldene Hallen”. Melodic heathen black metal is what Fimbulvet offer us, and they are really good at it! Balancing perfectly between melody and aggression, they composed one of the best albums of the genre… They don’t use keyboards in their music, but they have countless ideas on guitars, both on epic riffing and lead melodic lines. They manage to set the perfect pagan black metal background just with guitars, bass and drums and they complete their sound with the excellent vocals of Stephan. He sings both with brutal pagan vocals and with epic clean ones full of passion, creating the perfect dialogue between brutality and emotion. I believe he is one of the best singers in this genre and one of the reasons that “Der Ruf in Goldene Hallen” touches perfection. There is also a guest appearance with Natalie from Odroerir singing with her beautiful female vocals in the song “Heidenherz”, one of the best in the album. The work in the compositions is amazing and all songs have enchanting melodies and refrains, under a professional production. Compared to their debut the biggest improvement of the band is in their sound. This time they have found the right balance between all instruments and vocals. Even though they only use the typical “metal” instruments plus some acoustic guitars, they manage to sound very solid in a genre that is usually overcrowded by synths… All the lyrics are in German and they deal with pagan mythological themes. This album is released only in digipak version from Eichenthron (a rather unknown label, that did a very professional release) with very beautiful artwork and it’s limited to 1000 pieces. If you like bands like Menhir, Gernotshagen, etc, this band definitely deserves your attention. You can get a taste of their beautiful music on their official pages below.